Tran Anh Hung may not have the same name recognition among casual fans of Asian cinema as the likes of Ang Lee and Wong Kar-wai, but the Vietnamese director is no less revered by critics. His 1993 debut, The Scent of Green Papaya, earned him that year’s César Award for Best Debut as well as the Caméra d’Or at Cannes. Two years later Tran’s sophomore effort, Cyclo, starring Hong Kong’s very own Tony Leung Chiu-wai, won the prestigious Golden Lion at the Venice Film Festival. Tran has directed only three films in the near two decades since, a fact that has added to his mystique if not his fame. Showing as part of this year’s French Cinepanorama film festival, taking place between November 23 and December 14, Hongkongers have an opportunity they shouldn’t miss to see Tran’s latest creation, Eternity. From what has been revealed of Eternity so far – the experimental nature of the film, its themes – the most obvious comparison seems to be Terrence Malick’s Tree of Life. Is that a fair comparison? Yes, I would agree with that. Eternity is experimental because it’s the only way to express this idea [of eternity]. You can’t stop time and experience the present. Time is something that’s always pushing behind you and you have to keep on going. That’s why you see the death of a child, then in the next picture, it’s a wedding, then in the next scene it’s another birth. This occurs in a very short space of time onscreen. It creates a feeling, something that is a mix of everything, something that gives you the sense of melancholy about life. This manner of production was the only way to create the desired kind of emotion. Several years ago you mentioned your next project was going to be something that was so different it would change the way you make movies. Is Eternity what you were referring to? Did you already know that this was how you wanted to shoot it? Yes. For me, after several movies, I think in terms of making movies in the ‘old world’ way and the ‘new world’ way. This is because, for me, The New World is Malick’s masterpiece, not Tree of Life, which is not a good movie. Today, I believe there are two ways of making movies. One deals with scenes where there are shoots, cuts and edits. Another is the new world way, where we don’t have scenes to treat. Making movies that way is completely different to what I’ve done before, so it’s a big challenge and very scary. Because when you shoot a movie the old world way, you have scenes. If you shoot scene 64 and scene 12, at the end of the day you have a compilation. You can tell if the actors are great and you know whether the scenes work properly. In contrast – how we shot Eternity – you only have various shots of something that has no beginning, no end. At the end of the day you don’t have a solid scene to give you confidence. That’s why it’s very scary and poses a great challenge. How did this work on a day-to-day basis? Was it complicated to plan something so abstract? Yes. I’d prepare a set, at this location, with these actors, and the general idea of what I needed to execute for the movie. Beyond that, it was all improvisation. That’s why it’s quite special. It’s something I’ve never done before. Completely! It was quite scary and very difficult for the actors. They don’t have much dialogue and they didn’t have a concrete scene to treat. Nor could they tell if what they gave was good or not. It was difficult for them to judge things in all of this. So what advice did you give them as director? I would tell them, “You see this scene? Let’s do something like this. You, come from this way, and you, come from that way, and then look at each other and work together in the corridor.” Afterwards, we’d shoot it, then I’d make a few adjustments and alterations. At the end, I’d say we got what we needed. How many takes did you require to get the result you were looking for? Very few, because at the end, for dailies, I only had 22 hours of those. Normally I have about three times that amount. Is that because of the quality of the cast? No, I think it’s more related to the use of improvisation. When you have to do the same actions from different angles and they have to match, that takes a lot of time; especially if you have something very precise in terms of psychology to express, then you definitely need more time to shoot. In this movie, I had to get rid of scenes and that psychology. It was the only way to access the poetry. Poetry is at the heart of the film then? I would say so. Although, it’s not the kind of poetry we’re used to encountering. It’s where you see something on the screen – the colour, lights, smiles, words – and it suggests something to you; sometimes very personal or related to your life, or maybe a thought that transports you elsewhere. That for me, is quality poetry. When you read the original novel, what feelings did it inspire? I was really moved, especially because it deals with a family where a lot of people are involved. In contrast, my family is very small. I only know my parents and my brother. Because of the Vietnam War, I lost everyone, so my sense of the fragility of life is very strong. I don’t have a genealogy. My grandfather never told me any stories. 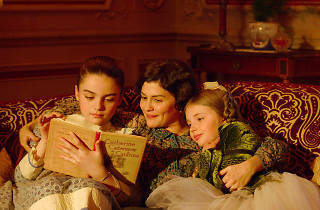 In the book, I saw a very large family and it was quite a fascination for me. And, more importantly, the book gave me the idea of a new style of filmmaking. Is the book structured in a unique way as well? No, it’s not that. It somehow has this quality of showing things in a different way. 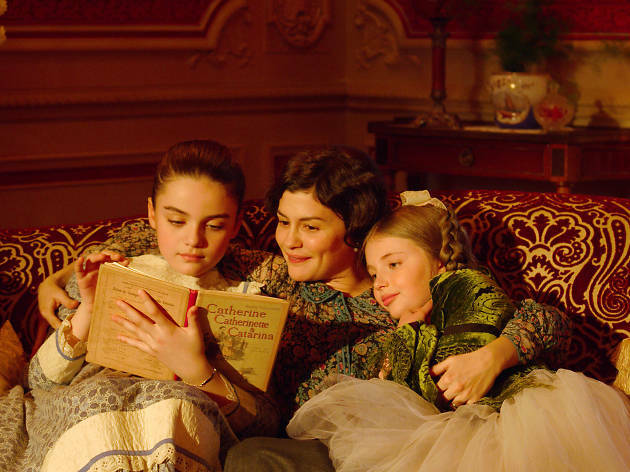 The film ignores all the conflict and horrors of the 20th century and focuses solely on the intimacy of the family. Why ignore history? Because we don’t care about all that. In 2000 years we won’t care about the world wars, it’ll just be something we know that happened. In this movie, there’s this very radical idea of getting rid of everything that’re not faces. People that look at each other and remember the past of the lives they share together. Maintaining only that. Nostalgia would mean that you like the period. That’s not the case. I don’t care. I don’t know this period. I don’t even know the bourgeoisie – I come from a poor family, so it’s not something I feel I have a strong connection to. It’s just the background and that’s it. I wasn’t eager to show costumes or things like that. The story of this family was all. You sound very pleased with the movie. Did you feel confident when you were making it? Yes, I would say that. Every shot that I made, I was sure that it was right. However, at the same time, I was scared because I didn’t know how it would all come together. I thought it could be something exceptional but that it could also be lousy poetry. That’s why it was quite scary. Are you ever going to make an ‘old world’ movie again in the future? Yes, of course. Certainly, some films you have to make clear, understandable and exciting. And in the language of cinema, those films aren’t sophisticated. Yet there’re still a lot of things to discover in the old world. There’s something beautiful, something specific to this art, in how you cut scenes in pieces, how you can shoot a story, how you can articulate it onscreen. How would you characterise Eternity in literary terms? It’s a poem rather than a novel. The prose is different. I’m speaking the common tongue of cinema. That’s the only language that matters to me as a film maker. Did you have this same appreciation for the language of cinema when you started out? Or did it develop over time? I had it from the beginning. When I was in film school, I learned something there. The only thing important to cinema is trying to explore the language of cinema. I’ve spent my life trying to define what is specific to cinema, to films and movies. It’s the only thing interesting to me. I don’t see cinema as something to simply learn about a place; it’s more of the language, the structure of how it’s done; how when you go from one picture to another picture if it creates emotion. Only then are we inside of what is specific to this art, because only cinema can give this kind of feeling. That’s what I’m looking for. So, at the end of the day, do you find anything to appreciate in the big Hollywood blockbusters? Definitely! I enjoy watching them. Sometimes the editing is much more interesting than in art house films. Art house movies can feel very long and boring with all the long, still shots. That’s been done to death, so why repeat it? It’s not interesting anymore. You know, I was watching a TV series the other day. There was one cut that was amazing, such that I’ve never seen before. It was very interesting, it gave me the kind of pleasure and emotions like when you’re looking at a good painting. You have an immediate feeling with unknown meaning. Eternity November 29, December 3 and December 7, various locations and prices. Visit hkfrenchfilmfestival.com for more information.